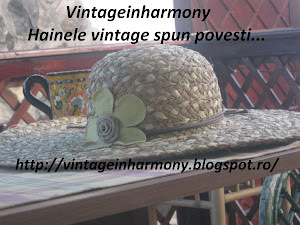 Vintageinharmony - hainele vintage spun povesti...: EXPEDIATA-CHELSEA & VIOLET MATASE NATURALA MARIME S ETICHETA REDUCERI DE IULIE ESTE INCA VALABILA, IN PLUS: LA PATRU ARTICOLE COMANDATE DE LA ACEASTA ETICHETA, IL PRMITI GRATUIT PE CEL CU PRETUL MAI MIC! LA TREI ARTICOLE, CEL CU PRETUL MAI MIC, LA JUMATATE DE PRET. VA ASTEPT! S.
EXPEDIATA-CHELSEA & VIOLET MATASE NATURALA MARIME S ETICHETA REDUCERI DE IULIE ESTE INCA VALABILA, IN PLUS: LA PATRU ARTICOLE COMANDATE DE LA ACEASTA ETICHETA, IL PRMITI GRATUIT PE CEL CU PRETUL MAI MIC! LA TREI ARTICOLE, CEL CU PRETUL MAI MIC, LA JUMATATE DE PRET. VA ASTEPT! S.